@renato_mariotti @NatashaBertrandH #TrumpInaugurationo #Corruptionw #Bribery #MoneyLaunderingL #WilliamBarro #JhoLoww will they Jho? What does Mueller’s 448-page report mean? Who is Barr protecting with his redactions? And why did Trump think he was "f*cked"? The Mueller report is finally out to the public, and AG William Barr left out A LOT of juicy details. He auditioned for the job with a memo attacking the obstruction case. He then pronounced his own judgment on obstruction. Now it is reported he may have substituted his own summary for Mueller’s. The only antidote is full transparency. Could @BarackObama's DOJ have to answer for the original wiretap FISA filing on Carter Page/@realDonaldTrump's campaign? @RepRatcliffe is on the hunt after AG Barr's belief that "spying" occurred on Trump's campaign. @aaronjmate That's nonsense. Your victory lap was based on Mueller - or Barr's reading of Mueller - supposedly supporting your argument. You're cherrypicking. It's clear to anyone with eyes. BREAKING: Attorney General William Barr tonight directed immigration judges to deny bond hearings to asylum seekers. Our Constitution does not allow the government to lock up asylum seekers without basic due process. We'll see the administration in court. Again. Just been informed by DOJ that we’ll receive Mueller’s report only after Barr gives a press conference. Once again, Barr wants to shape the public’s perception of the report. This is on top of reports DOJ secretly briefed the White House. This is not justice. Just PR. Why should Radical Left Democrats in Congress have a right to retry and examine the $35,000,000 (two years in the making) No Collusion Mueller Report, when the crime committed was by Crooked Hillary, the DNC and Dirty Cops? 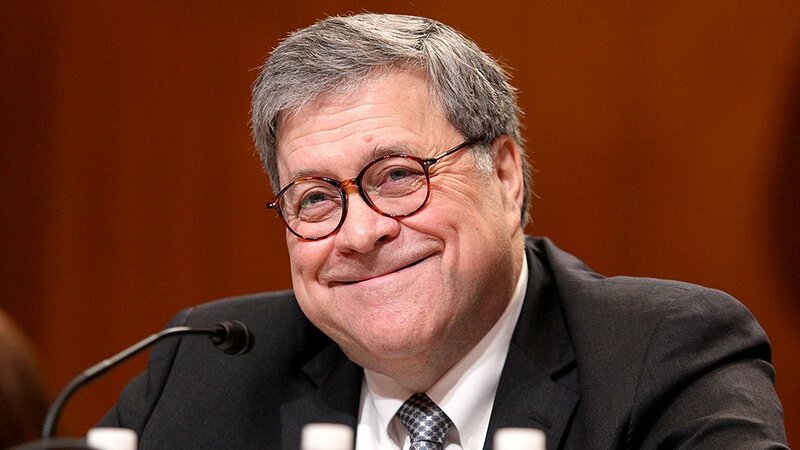 Attorney General Barr will make the decision! Bill Barr sent a letter purporting to summarize Mueller’s conclusions. He took it upon himself to reach a conclusion on obstruction. He adopted the President’s “spying” smears. Now, he will spin a report no one has read. My advice: Wait to read Mueller’s words for yourself. We’ve learned today that AG Barr deliberately distorted significant portions of the #MuellerReport. The House Intelligence Committee has formally invited Special Counsel Mueller to testify on the counterintelligence investigation. After a two year investigation, the public deserves the facts, not Attorney General Barr’s political spin. The Left’s partisan attacks on the Attorney General are disgraceful. Bill Barr has conducted himself in exactly the way the American people want their AG to act. He followed the law, provided as much of the Mueller Report as possible, and erred on the side of transparency. 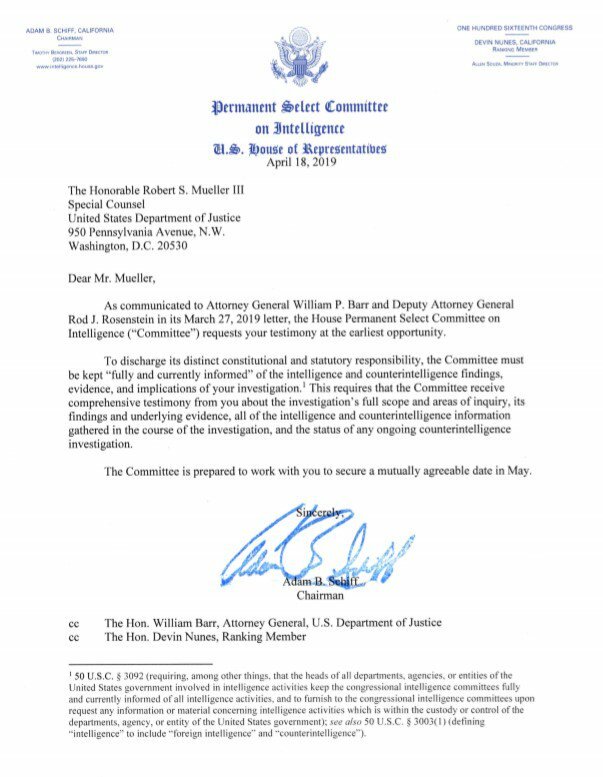 Congress has asked for the entire Mueller report, and underlying evidence, by April 2. That deadline stands. In the meantime, Barr should seek court approval (just like in Watergate) to allow the release of grand jury material.